Mr. Somawansa Amarasingha, the secretive leader of the JVP said that his party is totally against the SLFP policy of sharing power despite the alliance both parties have formed. In a wide-ranging interview with an online publication before his departure from an unnamed western country to Sri Lanka on Monday, Mr. Amarasingha castigated Sri Lanka’s Prime Minister Ranil Wickremesinghe for behaving like an American puppet and for “speaking like a ruler of a land occupied by the US”. He asserted that the India - Sri Lanka Defence Pact should be made a cornerstone of the island’s foreign policy. What the Janatha Vimukthi Peramuna did was to take whatever that could be available from Marxism creatively and infuse that with the indigenous culture of Sri Lanka - a form of a fusion, said Amerasinghe. He said it did not import Marxism in its outdated raw form, but infuse certain Marxist elements with the autochthonous Sinhala Buddhist culture, which is the result of more than 2000 years of an unbroken civilization that existed in the country. Amerasinghe said the alliance between the JVP and the SLFP was necessitated by the urgent national need of the country, since both parties were incapable of stopping the Ranil Wickremesinghe’s administration, which was trying to legitimize the already existing separatist trend in the country, on their own. Ranil Wickremesinghe, was giving up parts of the sovereignty and territorial integrity of the nation for his own personal ambitions, he charged. Speaking about the economic policies agreed by the two parties under the new alliance, Amerasinghe said that the national economy should be strengthened by investments coming from all parts of the world. He said since 1978 under successive UNP governments, the nation had unfortunately marched, not towards neo-colonialism as some say, but towards a re-colonization by certain imperialist powers. He said, Sri Lanka should accept all good things inherent in the globalization and reject all the unacceptable things that may harm the nation. Archeological excavations in the ancient capital of Anuradhapura, Amerasinghe said, showed Sri Lanka was having an open economy even in the 9th century, from the foreign coins that were found there. It was wrong to say it was Junius Richard Jayewardene, was the one who introduced an open economy to Sri Lanka. He said our economic policies for the past 26 years under the UNP had been formulated not for the mutual benefits of the country and the other trading nations engaged in trade, but to the detriment of Sri Lanka. He said, today every Sri Lankan citizen was indebted to about one hundred thousand rupees to foreign countries. Under this government national assets were being sold to cronies for a song, he charged. Analyzing the JVP’s economic policy he said it placed special importance to the indigenous capitalists of the country to invest in the country’s development. But he said indigenous and foreign capitalists had been discouraged, under Ranil Wickremesinghe since ministers expected, what is known in Sri Lanka, as “something” from the investors. An atmosphere had been created that everybody was after this “something” he charged. He said all barricades including that should be removed to make enterprises run with profits. He said if the businesses became profitless, then entrepreneurs would not be able to pay salaries of the employees and they could not also able to survive long. Amerasinghe pointed out that the JVP looked at this aspect through Buddha’s Sigalovada Sutta that said employers should treat the employees like fathers treating their children. He said the JVP looked at Marxism through our own indigenous culture. They always carried the pictures of Keppetipola and Puran Appu together with those of Marx and Lenin, he said. He said from ancient times, Sri Lanka’s strength had been in its agriculture that produced enough food for its population and its unique hydrological civilization, until the nations great irrigation systems had been destroyed by invaders from foreign countries. Imitating those great enemies of the nation, Amerasinghe said, today Sri Lanka’s Prime Minister was advocating abandoning rice fields. It was one of our greatest kings, Parakramabahu who said, that we should not let a single rain drop flow down to the sea, he reminded. He said they believed that all governments should rule their countries according to “dasa raja dharma” (the ten noble principles of the rulers). Amerasinghe said throughout Sri Lanka’s long history, no king was allowed to rule as a despot but only according to those ten noble rules. Any King who violated those noble principles was simply ousted, he said. He said Buddhism preached impermanence. Even certain aspects of Marxism were being outdated subject to this universal law. That was how China was making amendments even to the teachings of Chairman Mao Tse Tung. Marxists should not forget those basic facts, Amerasinghe said. He said as a nation, we should only grasp from Marx or any other teacher only the good side. He said, it was Dutugemunu, who built a great memorial for his enemy, and ordered that it should be respected. The order was carried out for centuries. Such was our noble civilization, Amerasinghe reminded. As a nation we could not accept all foreign dogmas in toto. Even Lenin had to accept that certain aspect of Marxism were outdated, hence the teachings of Lenin were born. That’s why China was changing what Mao taught, he further pointed out. He said many practices of the party had not been Marxist in nature, but they derived from Sri Lanka’s own autochthonous culture. He said all parliamentarians; provincial council members and all other local government representatives totally abstained from smoking and consuming alcoholic beverages. That discipline he said was not taken from European Marxism, but from Sri Lanka’s own indigenous Buddhist culture. He said the dedication, generosity and unity practiced at the local government body at Tissamaharama, in Southern Sri Lanka, run by the JVP was not taken from any Marxist society in Europe but from Sri Lanka’s own culture. All the monthly allowances paid to the members are being invested in the development projects of the local council. Under no circumstances those projects could be called Marxist, he argued. He pointed out that today Ranil Wickremesinghe is saying that he was told to do this and that by President George Bush. He asked why was he talking like a ruler of a land occupied by the United States. Was it because he thought that Sri Lanka was the 53rd state of the US? It was true that there were many things that we could learn from the West. The Internet was one such thing. Realizing this the JVP is using its MP’s salaries to buy computers and take the computer literacy to the village youths in Sri Lanka. Amerasinghe said using the mentality of an enslaved nation there wasn’t a single country that was developed in the world. He said India had strengthened its agricultural resources and together with fast developing industry, it is today a slave to no nation. The JVP leader pointed out that instead of selling the phosphate mines of Eppawela for a song, that very fertilizer should be used for our own agriculture. Amerasinghe clearly indicated that despite the alliance JVP was totally against the SLFP policy of sharing power. He said JVP opposed the power sharing since it created more problems than what it tried to solve. “In the future, if we implement the Power Sharing policy”, Amerasinghe said, “12% of the population of the country would get 1/3 of the whole land mass and 2/3 of the coastline creating a great inequality among the people of Sri Lanka”. While the JVP agreed to solve the problem by peaceful political means Amerasinghe said whatever solution reached should be accepted only by a referendum. He said on such an occasion the JVP would canvass the support of the parliament as well as the people against the SLFP policy. However he added that JVP would accept the verdict given by the people at a referendum. Opposing the sharing of the power policy, Amerasinghe said, the JVP would advocate a policy of decentralization of power even up to the village level. He said he did not know what solution the SLFP had in mind since the LTTE had rejected the proposals of the SLFP in 2000. He said no party should be allowed to interfere with the country’s sovereignty and for capitalist prosperity and the unity of the country was most essential. He said today NGO’s were spending money to produce television dramas and films to demoralize the nation and drive us to slavery and intensify their ambitions by presenting awards to the artists to encourage such works. Under the new alliance Somawansa Amerasinghe said special attention would be made to give back the national consciousness, which had been deprived, to the nation. He said the JVP - SLFP alliance would also pay special attention to maintain the rule of law in the country and suppress the current wave of crimes and fortification of the underworld under the UNP. He said Sri Lanka, which had been made a subservient nation in its foreign dealings should be immediately pulled back to its former respectable position enjoying an equal status with the other independent nations of the world. The former non-aligned foreign policy should be strengthened and the Indo - Sri Lanka Defense Pact should be made an important aspect of our foreign policy. He reminded how India had to pay heavily due to President Jayewardene’s grossly erroneous foreign policy, since that provoked India to arm the LTTE. Amerasinghe said by doing that, India also created a grave security problem for herself, since LTTE ultimately killed Rajiv Gandhi. He said India couldn’t afford a Tamil Eelam in Sri Lanka, since it was against the strategic interests of India’s regional security. 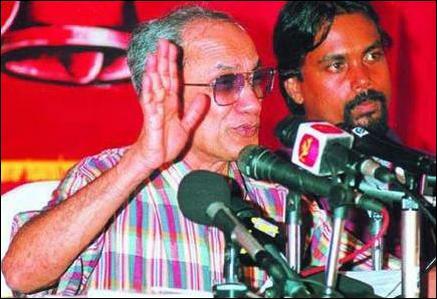 Amerasinghe said the JVP warmly embraced the proposed Defense Pact with India. Amerasinghe said while a 200-year-old USA wanted to teach all its citizens and all school children the country’s history, Sri Lanka wanted to stop the teaching of its history. The people have been made to forget the history of the nation and it’s identity. He said NGO’s should be debarred from interfering with the sovereignty of the nation and the teaching of history should be immediately introduced in the country’s schools. Reminding that the first European imperialists, the Portuguese invaded Sri Lanka in 1505 nearly 500 years ago, Somawansa Amerasinghe said ever since then the demand of the nation has been to clamour for the re-establishment of a political march compatible with the country’s indigenous culture and identity. Telling that this new political alliance was born during a period when the pains of labour for such a birth were being intensely felt the JVP leader said the historical task of the alliance was to perform the midwifery duties for the long awaited birth. On the 500th anniversary of our enslavement - next year, we should decide whether we wanted to take the same path to enslavement or to the national liberation, Amerasinghe concluded.